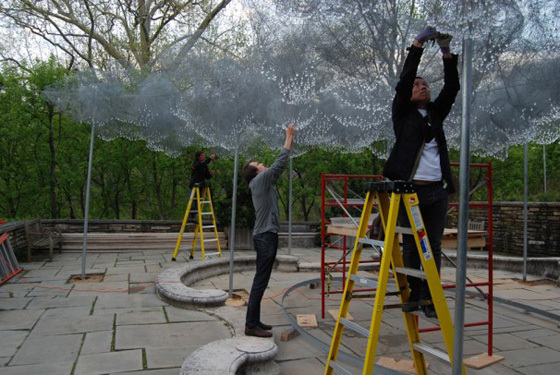 Last year a temporary installation was placed at Dumbarton Oaks in Washington D.C.. The installation, titled “Cloud Terrace”, was designed by Cao | Perrot Studio. The design responded to the hot, bright conditions of the space by extending the shade of the arbor across the terrace and animating the inside of the gardens. 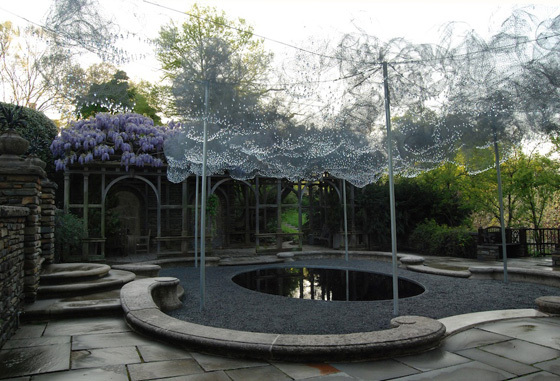 The form was created by using hand-sculpted wire mesh that suspended over the Arbor Terrace in an organic fashion. Embellishing the mesh were 10,000 Swarovski crystals. The outcome… a beautiful, sparkling display that entranced visitors in a cloud-like paradise. Now, think of this- how would you recreate this idea to meet a small budget? Maybe for a different type of environment or event? Creating the serene quality can be as simple as material selection. The wire mesh can be replaced by a mesh fabric. The crystals can be simulated by incorporating a layer of sparkling fabric with sequins or foil dots. And the organic nature? That’s the personality of fabric with a little structure to support it.